The typical paella a la valenciana was “invented” in a small village called El Perelló close to the city of Valencia. The unique situation of the village between a natural lake with sweet water and the sea provided to the habitants of the area all they needed to make a complete dish with many of the most important vitamins and minerals in a balanced combination. With farmlands at hand where they grew rice and beans, the sea for shellfish and the lake for ducks together with their chickens gave the people of the area all they needed to make 2 different versions of the paella a la valenciana. The first one is the paella made of meat. This paella is a combination of chicken and duck together with rice, lemon, olive oil, beans and saffron. But nowadays the duck is most of the times substituted by rabbit which is a lot easier to get and cheaper. 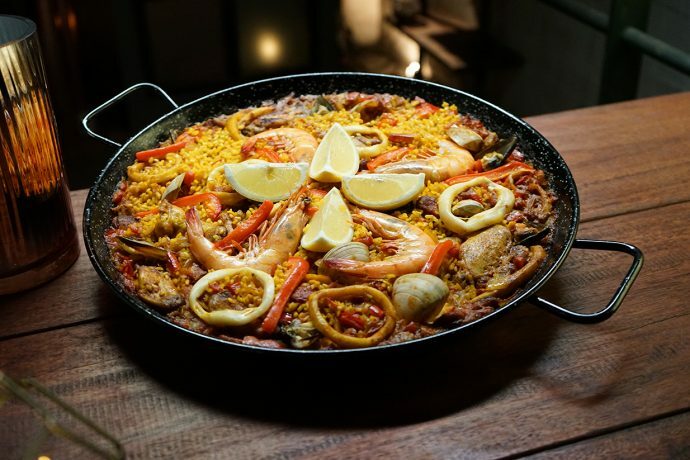 This type of paella is still very popular amongst the people of Valencia and it is very common to hear people say: “Sunday I am going to eat paella with my parents”. In the old days the paella was served in the paella pan and all who joined in at the table ate from the same pan with wooden spoons. Today most people prefer to have their portion on a plate. Another typical paella was the one made of seafood, Paella de marisco. This paella is made of rice and seafood. The used ingredients are: sepia, calamares, lobster, mejillón o clotxina, garlic, lemon, rice, saffron, olive oil and beans ( octopus, squid and mussel) Clotxina is a smaller variation of the regular mussel. o Green beans (70 grs.). o Haricot bean (25 grs.). o Olive oil (5 table spoons). The traditional way to prepare a paella is on a campfire but this is difficult to achieve at home so there is a very good alternative for this which is the double gas ring on a tripod with a bottle of gas. The most important points according my mother in law when preparing the paella are: the fire below the paella pan must be the same on every part of the pan, you must be able to adjust the fire in 2 rings an outer and an inner ring and the paella must be completely in balance so that when you add water the level should be the same everywhere on the paella pan. Step one: 12 hours before starting to prepare the paella put the garrofón (a type of bean typical to Valencia) in water. Step 2: Put the olive oil in the pan and when the oil is hot put in the chicken and rabbit and fry them until they have this golden look. We should try to distribute the pieces of meat evenly in the paella pan. Step 3: Now we put in the different beans and the garrofón and fry them. If we want to add alcachofa (artichoke) we can add it now also. Make sure the fire is not very intense but neither to low. Step 4: Add to the paella the red paprika powder and the natural tomato and mix them with the other ingredients. Step 5: After a few minutes we add water to the paella. This is another crucial step in preparing a tasteful paella. If we add to much water, the paella will be to weak and if we add to little the rice will not be boiled sufficiently. But there is a small insiders trick to know what the right level is. On the outside of the paella pan there are 2 grips attached. They are attached to the pan with rivets who are clearly visible on the inside of the pan. This is the level of the water that must be added. Don’t add more or less water it will ruin your paella. Step 6: Put the fire intensity on high but not to high. We leave the paella now boiling for 3 – 5 minutes and then we lower the intensity of the fire to medium. Try the paella and if needed add salt to it. Leave the paella this way for about 13 – 17 minutes depending on the type of rice you used. Step 7: A step that is forgotten by most people, turn out the fire and cover the paella with kitchen paper and leave the paella alone for another 5 – 10 minutes. In the meanwhile cut a lemon in 4 and when the 5 or 10 minutes have passed you can put the lemon on the outside of the paella. Preferred drink to go with the paella : a red wine from Valencia especially from the area of Utiel / Requena. (other Spanish wines will do also of course).